Oldest-known Mayan Astronomical Tables Found: Archaeologists working at the Xultun ruins of the Mayan civilisation have reported striking finds, including the oldest-known Mayan astronomical tables. Archaeologists working at the Xultun ruins of the Mayan civilisation have reported striking finds, including the oldest-known Mayan astronomical tables. The site, in Guatemala, includes the first known instance of Mayan art painted on the walls of a dwelling. Perhaps most intriguing among the finds were several finds related to astronomical tables, including four long numbers on the east wall that represent a cycle lasting up to 2.5 million days. The east wall is mostly covered by tabulations of black symbols or "glyphs" that map out various astronomical cycles: that of Mars and Venus and the lunar eclipses. 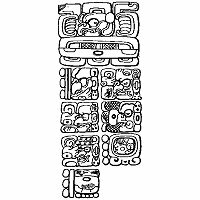 The Xultun find is the first place that all of the cycles have been found tied mathematically together in one place, representing a calendar that stretches more than 7,000 years into the future.